Release Micromax YU Yureka smart mobile with Cyanogen has made it complex and is leaving most of the techies and smart mobile freaks in ambiguity to choose a better choice between the One Plus One mobile. Then here we end this ambitiousness with this post which would ensure and helps all the tech freaks and smart device lover who wish to upgrade to the new smart device. Indian smart mobile manufacturer Micromax has launched its much awaited and prognosticated smart device YU Yureka which has been classified under YU series of smartphones and operates on latest updated version of Cyanogen OS. What makes it more special of a kind is that its budgetary cost of Rs 8,999 in Indian domestic markets and is a first domestic branded smart device to be launched with Cyanogen OS in India. Though it is powered with Cyanogen OS Micromax YU Yureka appears as Android smartphone with the bewitching and captivating specifications, features and most concerned factor in India budgetary price. For those who aren’t aware of the Cyanogen OS let me make it clear that Cyanogen software is based on the Android operating system, popular for the host of customization and features it provides over stock Android. Recently there has been a rival between the Indian smart mobile giant Micromax and One Plus One with the launch of Cyanogen OS smartphones in India where Micromax is claiming that One Plus One has been infringing its exclusive rights over Cyanogen in India and filed an lawsuit. Check out the best specifications of these two smart gadgets and find out which gadget has the best aspects of Cyanogen with this review. Micromax Yureka has 5.5 inch IPS display with HD resolution of 1280 x 720 pixels while dissimilar to the One Plus One it is facilitated with the full-HD screen which implies that the number of pixels per inch are less and One Plus One comes with a resolution of 1280 x 720 pixels in comparison. We sensed that colours to be a little over saturated in the Micromax YU Yureka mobile however we didn’t notice distortion due to lower pixel density and are not pretty sure if it has got to do with the custom icons of the default theme that look a little too vibrant or the display. Other most concerning factor is that both smartphones have a layer of Corning Gorilla Glass 3 for added protection against scratches. Micromax YU Yureka and One Plus One operates on Cyanogen OS 11 based on Android 4.4.4. Cyanogen offers features and options which are not found in the official firmware distributed by mobile device vendors. Cyanogen supports native theming support, FLAC audio codec support, a large Access Point Name list, an OpenVPN client, Privacy Guard – a per-application permission management app, support for tethering over common interfaces, CPU overclocking and other performance enhancements, soft buttons and other “tablet tweaks”, toggles in the notification pull-down (such as Wi-Fi, Bluetooth and GPS), as well as other interface enhancements. 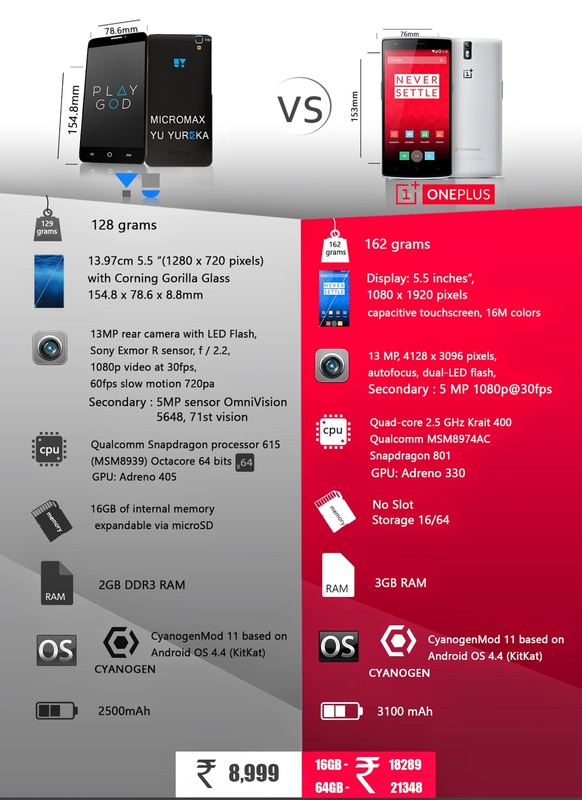 Cyanogen is found to be a key aspect to increase performance and reliability compared with official firmware releases. Micromax assures stating that their smart device Yureka would turn out as an best and is the first smartphone to to get the Android Lollipop OS based version of Cyanogen on the other hand One Plus One smart device may not get the Android Lollipop OS based version of Cyanogen in India right now. Micromax Yureka has been offered with 16GB of inbuilt memory space and supports an external secondary storage up to 32 GB using a microSD card; on the other hand One Plus One comes with 64 GB of inbuilt space at just Rs 21,999 and doesn’t have any external memory card slot to expand the memory and is double the cost of the Yureka. Mircomax Yureka operates on 64 bit Qualcomm Snapdragon 615 octa core chip with 1.5GHz processor cores, Adreno 405 graphics and 2GB DDR3 RAM and sports the latest internals and is one of the cheapest devices to offer 4G connectivity and a chip based on 64 bit architecture. Micromax Yureka has Qualcomm’s latest chip supports dual-mode 4G LTE connectivity with support for both LTE TDD 2300MHz and LTE FDD 1800MHz bands covering most present and upcoming Indian 4G networks. However Mircomax Yureka has 2GB of RAM, which is lower than the 3GB RAM on the OnePlus One which would leave an impact and has effect if you are really concerned of high end performance while it has no noticeable difference in the speeds in the two phones. Micromax Yureka operates and functions with 2500mAh battery while One Plus One functions with 3100mAh battery which makes it clear with less battery power backup although as per most of the smart devices users you can judge the battery power backup unless and until you use it as per your specifications however the battery power test and our personal test with One Plus One was good. One Plus One and Micromax Yureka both the smart devices has 13 MP od rear camera (f2.2 aperture, capable of 1080p video capture) with Sony EXMOR CMOS sensor and a 5MP front camera with 71 degree field of view. What makes Micromax Yureka somewhat special is that its capability to shoot slow-motion videos as 60 frames per second and a future software update will make it capable of shooting slow motion video at 120 frames per second which stands a s fascination aspect for those who wish to explore some sort of photography with their smart device. Micromax Yureka has been offered with the CyanogenMod Camera app that offers granular settings for controls including size, quality, shutter speed, focus duration, focus mode, and ISO, among others. Vertical swipes change the scene mode while a horizontal swipe allows you browse pictures and videos shot with the phone. The app offers Panorama, Burst and HDR modes. Photo clarity varies with both the phones. On a concluding note, I would like to state that One Plus One which is acclaimed as flagship killer offering high end features is better option while if you are really looking for an mobile with that of similar features then you may opt Micromax Yureka as it is one of the best budgetary mobiles in the recent times with best top notch features in the price slab of Rs 10,000 below price in India. At the Micromax Yureka is assuring a software update with doorstep service and replacements and a great warranty policy this would leave out one of the best mobile with Cyanogen. Stay connected for more tech updates. Google on Tuesday launched the Google Chromecast and Nexus 6 in India to kick off the three-day Great Online Shopping Festival (GOSF) starting on December 10. The Chromecast will costs Rs 2,999 and and will be available on snapdeal.com and select Airtel stores across India. Airtel is offering Chromecast customers a range of subscription offers. Existing broadband users can access 60GB of data for 3 months when they purchase a Chromecast, while new customers can get the same, and zero activation fee for their new broadband service. The Nexus 6 from Google & Motorola was also unveiled and will be available to buyers on Google Playstore at Rs 43,999 for the 32GB and Rs 48,999 for the 64GB version. It will be available in Midnight Blue or Cloud White colour options. Chromecast connects with smartphones, tablets and PCs to stream online content to TVs. However, unlike Apple TV, it doesn't officially support streaming of local content to TVs to prevent copyright infringement issues, and connects to an online server for beaming content. App makers need to add support for their apps for users to be able to stream content through their devices. 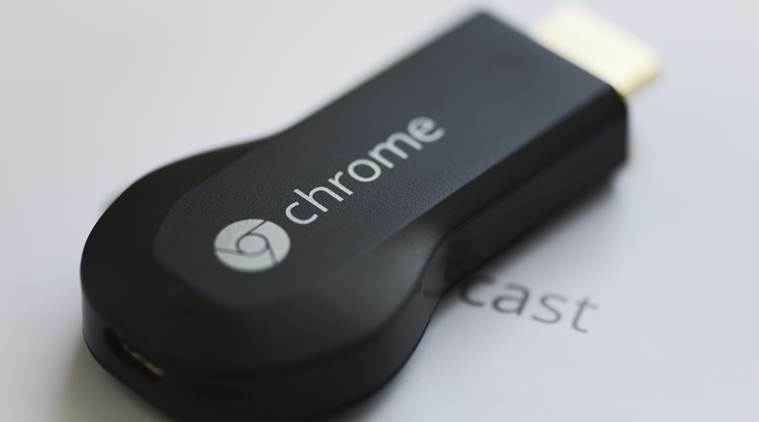 However, users can still 'cast' their Chrome browser tabs to the Chromecast. This implies that video playing on any web page can be streamed. This feature is in beta and there's considerable lag in the mirroring. The Chromecast also allows users of Nexus phones and certain other high-end phones to mirror their phone screens on their TVs.